I’m still in denial that climbing season is coming to an end in the Sierra’s. Similar to my attempt on Bear Creek Spire a month ago, this weekend I decided to climb a classic by braving colder weather and threading a weather window. 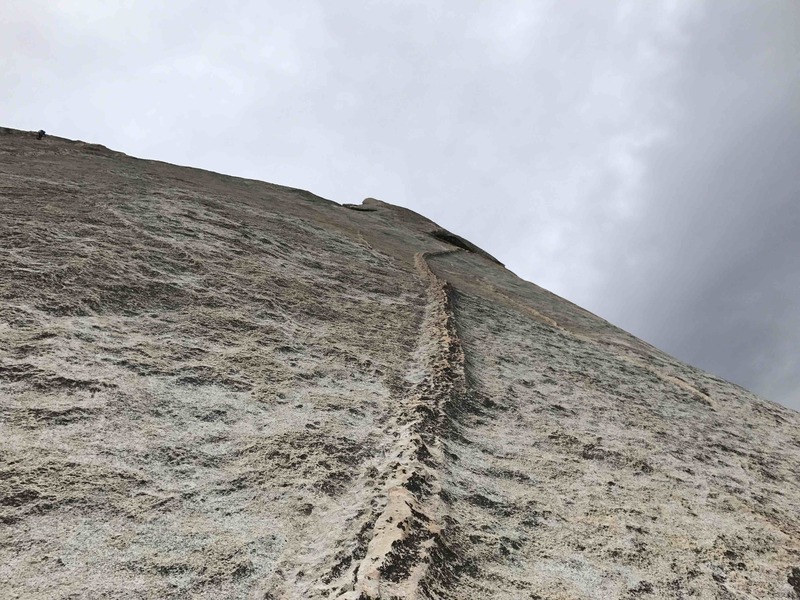 The idea was that we’ll have the stiflingly popular Snake Dike (5.7 R ⭑⭑⭑⭑⭑) that climbs 800′ up the side (and tops out on) Half Dome to ourselves. 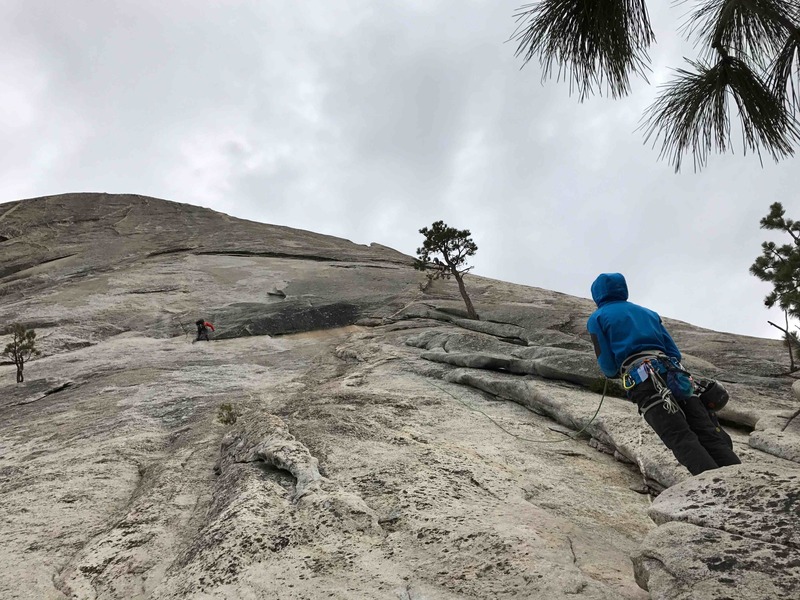 I mean, who else is going to try to climb a granite dome with projected rain in the afternoon? The reason Snake Dike is so popular is simple. It is epic. It features massive run outs (sometime 65′ between bolts), amazing scenery and a strenuous 3-4 hours approach/decent (6 miles up / 9 miles down). Sadie, Jeremey, Lucas and I left Oakland around 7pm Friday night and ‘borrowed’ an empty camp spot at Upper Pines around midnight. 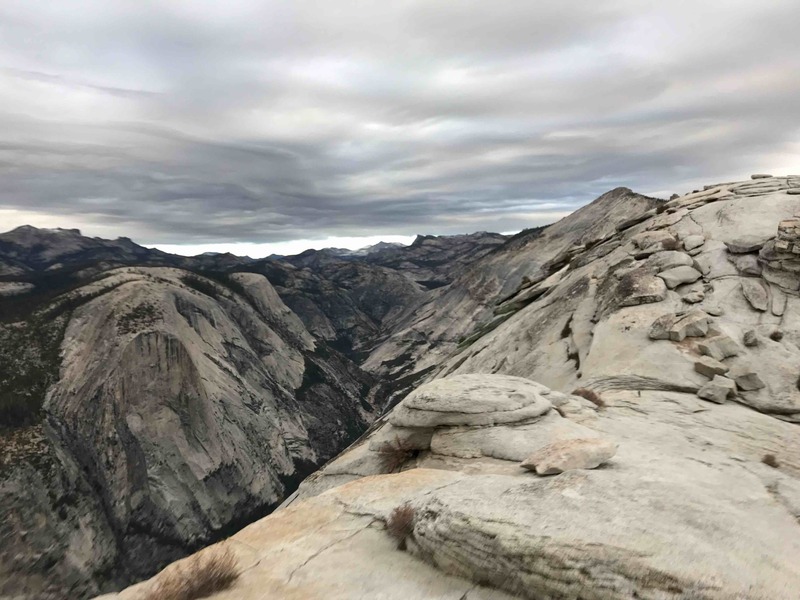 We woke up at 4am after four hours of sleep with the intention of starting early enough to be off the granite dome by 2-3pm when rain percentages started picking up. Things took a little longer and we were on the trailhead from Happy Isles towards the iconic Mist Trail at 5:30am. Team’s all here! Quick photo at Vernal Falls on the Mist Trail approach. Light was peering into the valley by the time we reached the top of our first waterfall (Vernal). 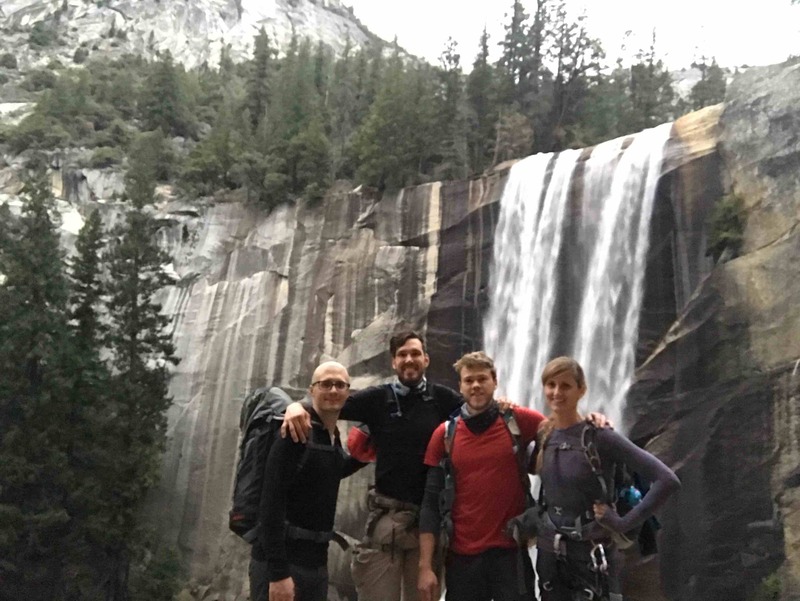 Following the simple map from SuperTopo’s Yosemite Free Climbs we passed Nevada falls and turned off the Muir Trail on the first leftward trail after it forks by 9am. From here the approach is a bit uncertain as there are many trails and many cairns. 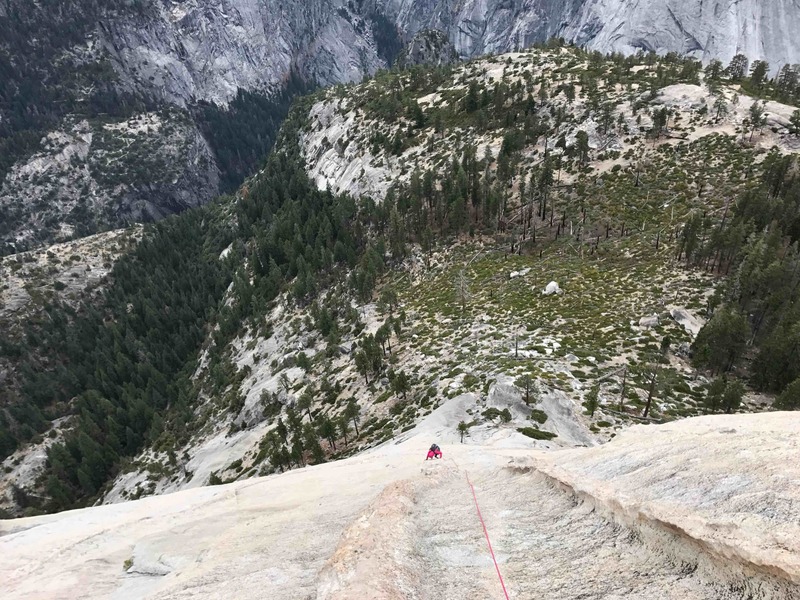 If you are doing this, just pick routes that head upwards and stay close to the base of Half Dome. 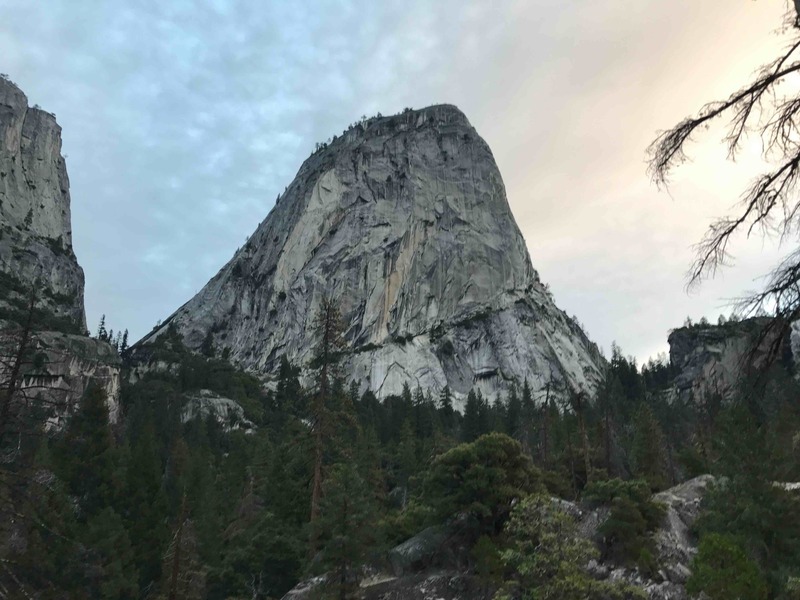 Beautiful Liberty Cap shooting up to our left as we head towards Nevada Falls. The 3500′ elevation gain on the approach was a workout and we ate a 9:45am lunch at the base before continuing (Sadie brought pizza!). We let one party go ahead of us who ‘said’ they were ‘simul-climbing’ since they should have been fast, but they weren’t and they still basically belayed each pitch. Next up was Jeremy and Lucas, followed by Sadie and I. I started climbing at 11am surrounded by gray ominous clouds and 20mph winds. This first pitch was the crux for me. Just under the roof is this orange section of slick rock and I saw one leader fall multiple times. I made it through clean by going high with my feet and using a soft lieback with the finger cracks. The SuperTopo makes this section (and the next friction traverse) look much longer then they were in person. They really weren’t that bad. Jeremy leading first pitch, just passing the friction crux. All that orange under the roof is useless slick granite. After Pitch 3 the traverses are over and you start cruising up on these 5.6 or less dikes with only one bolt between each 120-140′ pitch. If you fall, you are going a long ways. However, this really didn’t bother me on lead since it felt like a 5.fun monkey climb up a rock ladder. The wind died down after Pitch 2, but picked up towards the top reaching 25-30 mph gusts that pushed you around. A shove from a 25 mph wind gust almost caused me to fall on the alternative 5.7 friction traverse I did on pitch 7. Towards the end we started linking two pitches at once with our 70m rope. Which worked when combined with a couple dozen feet of simul climbing by the belayer. I set up the final anchor in a slab after a 3.5 hours climb where we unroped and finished the route by walking up a few hundred feet of 3rd class slab under these heavy wind gusts. Bare feet in thin rubbered climbing shoes in this cold and gusty weather caused my climbing partner’s feet to be numb at this point. Imagine yourself walking up a steep rock face on short stilts where if you slip you’ll tumble a few thousand feet to the ground. It wasn’t a fun finish for them, but once at the top we were able to warm up their feet for the descent (and put on socks / boots). 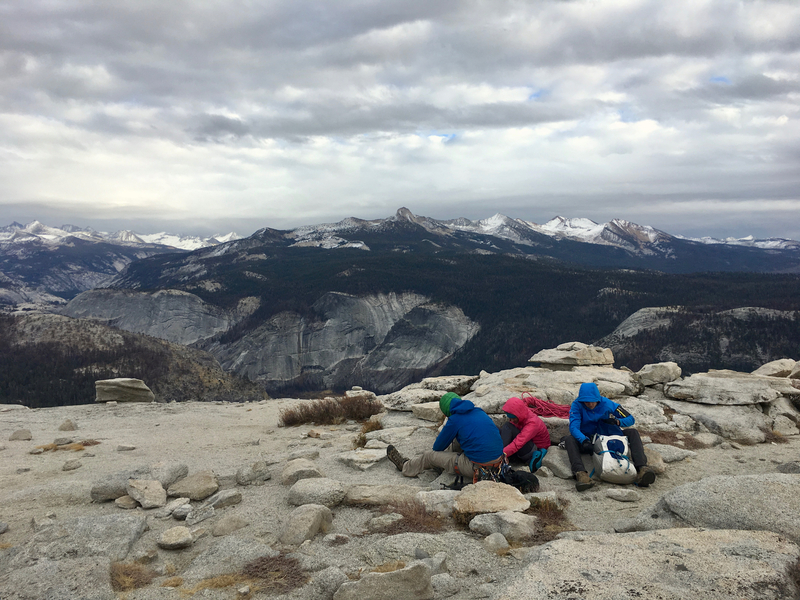 After little bit warming feet, drinking water and racking our gear we descending from Half Dome via the prussics on the steel Half Dome cables (which were down for the season). Not before witnessing a base jumper disappear over The Diving Board in their squirrel suit, rocketing 4000′ towards the valley floor. One of the many striking views on the climb. This one from the base of the cables. At the base of these granite domes we were finally out of the wind. Yay! Now just a 4 hour, 9 mile descent to trailhead. Luck was on our side as the forecasted rain never came despite the ominously gray cloud cover all day. Light became dusk and then night. We finished as we started, in the dark. We returned to the car 14.5 hours after we began to celebrate with four 21st amendment beers! Given we had no campsite and all food options were closed we decided to drive back to the bay. I was feeling in high spirits and took the first two hours before I felt dangerously zoned out from the last 22 hours without sleep and took a nap in the backseat until reaching Oakland at 1am. Snake Dike is a wicked route with an approach / decent that makes you earn it. However, the cost is worth it. 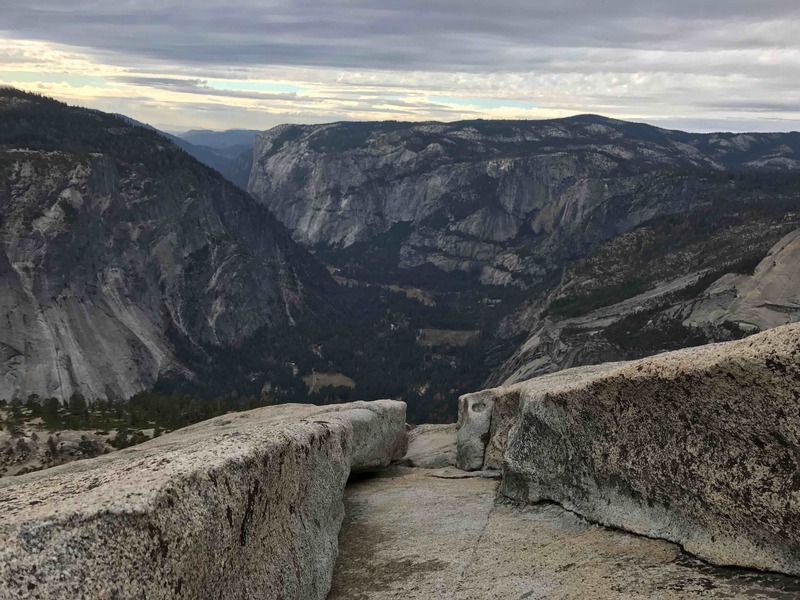 You cannot beat the environment of being surrounded by snowy peaks, huge granite domes, gushing distant waterfalls and glorious Yosemite Valley. What a great time!